Following our successful bid to the HEFCE Catalyst Fund, which aims to drive innovation in the higher education sector, Digital Education and CALT launch a new project today called UCL Action for Curriculum Enhancement (ACE). UCL ACE is one of 67 new HEFCE-funded projects which will develop and evaluate small-scale, experimental innovations with specific cohorts of learners and will run for a period of 18 months. The project links to our commitment in the UCL Education Strategy 2016-21 to the development and implementation of the Connected Curriculum and the ABC learning design process. It aims to develop and evaluate UCL’s innovative rapid-development approaches to blended curriculum design, which focus on a framework for research-based education (Connected Curriculum) in order to make a curriculum development pack available to all HEIs interested in improving programme design and engaging students in research-based learning. The project will evaluate the impact of our ABC rapid-development approaches to programme development on student outcomes and experience via case studies, produce an online and downloadable pack which can be adapted and used by any higher education institution and establish a supportive community of practice around its implementation. Across UCL programmes of study are being re-designed and developed to engage students much more actively in enquiry-based learning with the Connected Curriculum (CC) framework introduced to facilitate these changes. In parallel we have seen growing use of digital resources and approaches to support new modes of study such as blended learning. UCL aims are to ensure that educational intentions, outcomes, activities and assessments are aligned to form a cohesive, connected and effective learning experience for our students, and that programmes of study enable students to connect more effectively with researchers, with the workplace, with each other, and with local and wider communities. However we recognise planning rich and complex learning environments requires a structured, dialogic approach to effecting change in programme and module design. UCL has therefore piloted an integrated set of ‘light touch’ but focused learning design approaches, including workshops, CC guides, digital benchmarks and online support. One key component is ABC, our effective and engaging hands-on workshop trialled with great success over a range of programmes. In just 90 minutes using a game format teams work together to create a visual ‘storyboard’ outlining the type and sequence of learning activities and assessment and feedback opportunities (both online and offline) required to meet the module’s learning outcomes. ABC is particularly useful for new programmes or those changing to an online or more blended format. This approach generates high levels of engagement, creative informed dialogue and group reflection about curriculum design among even time-poor academics. This is a highly transferrable methodology already trailed at Glasgow and Aarhus (DK) Universities. There are versions in Spanish and Dutch following other workshops run in Chile and Belgium. In addition, we are introducing workshops to enable programme leaders and teams to work with students to benchmark their programmes in line with the descriptors of the Connected Curriculum framework, using a published Guide. For this project, we aim to continue to deliver this range of dialogic workshops but track their effects and impacts carefully, using a combination of focus groups (with staff and with students), individual semi-structured interviews with key stakeholders, and analysis of programme-level and module-level metrics. We will use this focused analysis to develop a resource pack to enable these developmental activities to be scaled up, both with and beyond UCL. Clive Young (UCL Digital Education), will lead the project team which will include ABC co-developer Natasa Perovic (UCL Digital Education) and CALT colleagues. CALT staff and ELE worked together to incorporate Arena student feedback into reworked Moodle spaces. The report below is organised around before-and-after screenshots, explains the changes, sets out a house style, and concludes with a checklist. When we next ask students for feedback, we hope to find improvements in orientation, organisation and communication. We also hope that the Moodle work, in-person activities and individual study will integrate even better together. Conciseness, consistency, glanceability, signposts and instructions were the most important things to come out of this work. Update Dec 2015: there are now three posts on our refinements to this peer feedback activity: one, two, and three. Readers have been begging for news of how it went with the Moodle Workshop activity from this post. 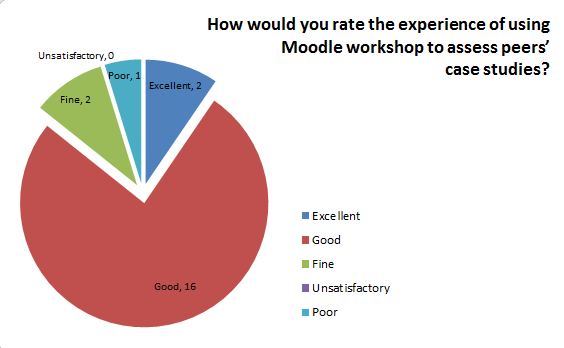 Workshop is an activity in Moodle which allows staff to set up a peer assessment or (in our case) peer review. Workshop collects student work, automatically allocates reviewers, allows the review to be scaffolded with questions, imposes deadlines on the submission and assessment phase, provides a dashboard so staff can follow progress, and allows staff to assess the reviews/assessments as well as the submissions. However, except for some intrepid pioneers, it is almost never seen in the wild. The reason for that is partly to do with daunting number and nature of the settings – there are several pitfalls to avoid which aren’t obvious on first pass – but also the fact that because it is a process you can’t easily see a demo and running a test instance is pretty time consuming. If people try once and it doesn’t work well they rarely try again. Well look no further – CALT and ELE have it working well now and can support you with your own peer review. Students on the UCL Arena Teaching Associate Programme reviewed each others’ case studies. 22 then completed a short evaluation questionnaire in which they rated their experience of giving and receiving feedback on a five-point scale and commented on their responses. The students were from two groups with different tutors running the peer review activity. A third group leader chose to run the peer review on Moodle Forum since it would allow students to easily see each others’ case studies and feedback. This indicates that the measures we took – see previous post – to address disorientation and participation were successful. In particular we were better aware of where the description, instructions for submission, instructions for assessment, and concluding comments would display, and put the relevant information into each. Insights about their own work from considering others’ work. Being able to edit their submission in advance of the deadline. The improved instructions letting them know what to do, when and where. This hasn’t been formally evaluated, but from informal conversations I know that the two group leaders appreciate Moodle taking on the grunt work of allocation. However, this depends on setting a hard deadline with no late submissions (otherwise staff have to keep checking for late submissions and allocating those manually) and one of the leaders was less comfortable with this than the other. Neither found it too onerous to write diary notes to send reminders and alerts to students to move the activity along – in any case this manual messaging will hopefully become unnecessary with the arrival of Moodle Events in the coming upgrade. Improve signposting from the Moodle course area front page, and maybe the title of the Workshop itself, so students know what to do and when. Instructions: let students know how many reviews they are expected to do; let them know if they should expect variety in how the submissions display – in our case some were attachments while others were typed directly into Moodle (we may want to set attachments to zero); include word count guidance in the instructions for submission and assessment. Consider including an example case study & review for reference (Workshop allows this). Address the issue that, due to some non-participation during the Assessment phase, some students gave more feedback than they received. We originally had a single comments field but will now structure the peer review with some questions aligned to the relevant parts of the criteria. Decide about anonymity – should both submissions and reviews be anonymous, or one or the other, or neither? These can be configured via the Workshop’s Permissions. Let students know who can see what. Also to consider – we could also change Permissions after it’s complete (or even while it’s running) to allow students to access the dashboard and see all the case studies and all the feedback. 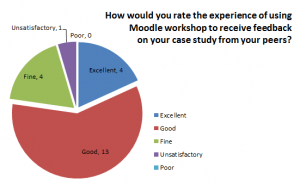 Have you had a good experience with Moodle Workshop? What made it work for you? Make videos for teaching on an iPad…How quick was that! They say that technology moves so fast it is hard to keep up. I discovered the iPad app Adobe Voice at the beginning of the year, after a friend showed me a totally appealing Christmas video her 8 year old nephew had made in minutes. I immediately thought that the ease with which Adobe Voice enables you to add a voice-over to pictures and text would make it an ideal stress-free way to make teaching videos – an introduction to a course, an announcement at the beginning of the week, a prompt for the class debate, an assignment guide …endless possibilities in a blink of an eye. Adobe Voice allows you to add images from your camera roll. Take a few screen shots of your course on your laptop, or snap something interesting in the street, and save your pictures somewhere you can access on your iPad. That could be a dropbox, a shared drive, or on cloud based photo storage like iCloud or Amazon Cloud Drive. You could even save your PowerPoint slides as images, but that would probably work best if they didn’t contain much text. You can combine words with your own images in Adobe Voice, add icons or access a stock of Creative Commons images from Flickr or Pixabay.com within the app. Recording audio over each slide is as simple as pressing the microphone icon beneath the image and talking. The best thing about the app is that it encourages you not to say too much. Because it breaks your audio into chunks, it comes out more naturally, with fewer stumbles and less need to re-record. If you do re-record, however, that’s easy too. You can add music or not, and select from various themes that put different animation effects into your video, so the end product looks interesting and professional. In January, it seemed to me that the only drawback was the need to upload the video to Adobe Creative Cloud before you could embed it in your course for your students to see. The video didn’t seem to play all on devices. Yet, thanks to the speed of those technological developments, you can now save your video to your camera roll and use the marvellous YouTube Capture app to upload your video to YouTube in a blink of an eye. You can even do a few more edits like adding subtitles and annotations. How easy is that? Very. So I made this video to show you how I made this video. Want more? UCL Arena Digital starts Monday 2nd March..